3D panel wall mortar plaster machine for sale manufactured by Gaodetec saves time and money during the usage. 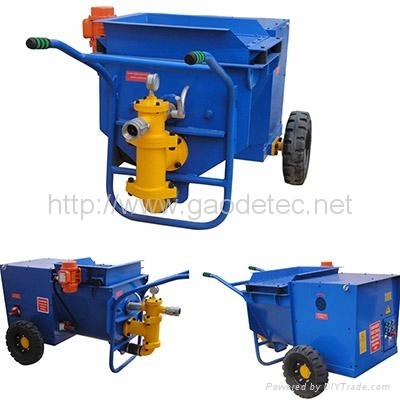 This mortar plaster machine for sale is the ideal sealing, strengthen, the stability of rock and soil and tunnel, hydropower project construction, etc., and also used for spraying mortar in construction and 3D Panel, etc. Mortar plastering the plane has the advantage of using a small amount of training, anyone can become a plasterer spray. By spraying mixed mortar you take away a lot of manual work, leave you skilled mason's smooth and finishing touches. Gaode Equipment Co.,Ltd. is a leading supplier of mortar plaster machine in China, as well as a unique supplier with ISO 9001:2008 and CE certificate in above products in China, our products have been exported to the USA, Canada, India, Malaysia, Pakistan, Korea, Bahrain, Nepal and so on. For more information about plaster machine for sale, please free to contact us.